In previous post, we looked at what “Argument Completion” is and how to use the predefined argument completers in TabExpansionPlusPlus. 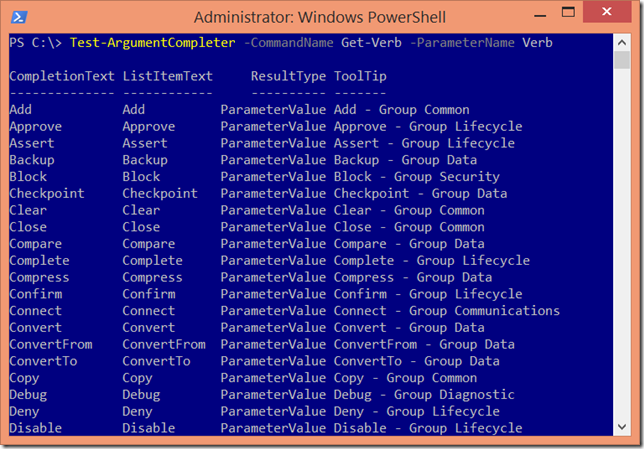 Now it’s time to start building your own custom argument completers as part of your PowerShell toolmaking. Creating your own custom “Argument Completer”. 1. Create an “Argument Completer” function/scriptblock (that will provide the list of valid arguments). 2. Register the “Argument Completer” for the command with the specific parameter using the above function/scriptblock. 3. Validate the functionality of the “Argument Completer”. The auto-completion text, tooltip and/or list items will be populated by this “argument completer” function. In the example below, we provide auto-completion for the cmdlet “Get-Verb” and it’s parameter “-Verb”. Get-Verb -Verb <TAB> to trigger auto-completion or <CTRL+SPACE> to (re)invoke auto-completion. Get-Verb -Verb <SPACE> to trigger auto-completion or <CTRL+SPACE> to (re)invoke auto-completion. Requirement #2: We also want tab completion or Intellisense to complete typed words in arguments using the $wordToComplete parameter value. Get-Verb -Verb D <TAB> or <CTRL+SPACE> to (re)invoke auto-completion. 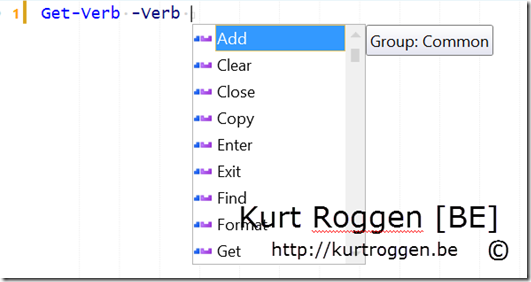 Get-Verb –Verb D <TAB> or <CTRL+SPACE> to (re)invoke auto-completion. The code below will provide the above described requirements. $commandName = The name of the PowerShell command that the auto-completer applies to. 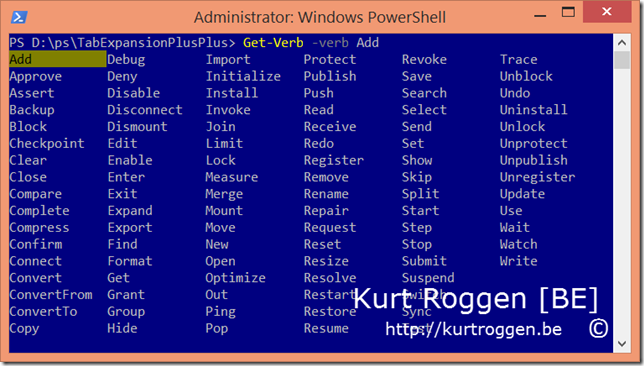 $parameterName = The name of the PowerShell command parameter that will be auto-completed. $wordToComplete = The partial text that will be auto-completed. $commandAst = The parsed representation of the command being completed. $fakeBoundParameter = The equivalent to $PSBoundParameters that shows all parameter bindings before execution. After you have created a custom argument completer function, the Register-ArgumentCompleter command must be used to register your custom argument completer function with the appropriate PowerShell commands and parameters. -Parameter = The name of the parameter that the auto-completer function will auto-complete values for. -ScriptBlock = The PowerShell scriptblock that will be executed when the argument completer is invoked. -Description = An optional description of the registered argument completer. Now that the registration is completed, the custom argument completion for the cmdlet “Get-Verb” is available. After you have created your custom argument completer function and registered it, you should test auto-completion to ensure that the function is working as expected. The TabExpansionPlusPlus module includes a command to aid in this testing called Test-ArgumentCompleter. -CommandName = The name of the command whose argument completer will be tested. -ParameterName = The name of the parameter, on the command specified in the -CommandName parameter, whose argument completer will be tested.